The nation’s greedy corporations and insatiable wealthy are fattening themselves on workers. There’s no trickle down. It’s the opposite; the rich have been sucking the economic lifeblood from the middle class for decades. When reckless Wall Street banksters get taxpayer-funded bailouts, billionaires get tax breaks and gigantic corporations like GE and Bank of America pay absolutely no federal income taxes, they’re getting for free the very public services that enable them to make massive profits in this country – the courts, the roads, the trade regulators, the patent enforcement. The middle class doesn’t get those big time special deals and loopholes. Workers pay their taxes. As a result, it’s workers footing the bill for the government services that enrich the rich. Greedy corporations, their CEOs and the right-wing politicians they buy with tens of millions in campaign cash are freeloaders. It’s time workers stood up to the freeloaders. Join Monday’s We Are One rallies. These demonstrations across the country by religious groups, social justice organizations and labor unions will illustrate that the middle class is mad as hell and not going to take trickster economics anymore. It’s time for greedy corporations and the insatiable rich to pay their fair share. It’s time to stop cuts to the government programs most treasured by and vital to the middle class and the vulnerable in this country – education, public transportation, Social Security. It’s time to stop right-wing attempts to terminate democratic rights like collective bargaining and voting without harassment. It’s time for the middle class to stop paying for everything and for the insatiable rich and greedy corporations to start sharing the sacrifice required to recover from the economic crisis caused by reckless gambling by Wall Street bankster corporations. March for your rights Monday. March for the middle class facing record rates of foreclosure, unemployment, child poverty, and loss of opportunity as country club conservatives cut off college loans and Head Start. March for the right of college students to register and vote in the towns where they study. March for the right of workers to band together, elect representatives and bargain with employers for better pay and working conditions. March for the right of the people to insist that corporations pay at least the same rate of taxes as workers do. March to end tax breaks for the wealthiest one percent who have now acquired more wealth than all the workers in the bottom 90 percent. Greedy corporations, the insatiable wealthy and their purchased politicians have for three decades skewed public policy to enrich themselves while pushing down wages and benefits for the middle class. From 1947 to 1975, a time of strong unionization in the workforce, real wages of average workers increased with productivity. The 75 percent rise in productivity and the nearly matching rise in wages gave the United States the largest, most vibrant middle class in the history of the world. Since 1978, productivity grew 86 percent, but compensation for workers grew only 37 percent, and if the cost of benefits, mostly uncontrolled health insurance increases, is removed, the real average hourly wage did not rise for 35 years, according to Alan S. Blinder, professor of economics and public affairs at Princeton University and a former vice chairman of the Federal Reserve. Here’s how it works: The nation’s largest corporation, General Electric, earns tens of billions in profits from the labor of its workers but refuses to share the benefits with them. GE is expected to demand that its 15,000 unionized U.S. workers accept benefit cuts. So they’ll pay more for their retirement and health care and have less money to live and to pay taxes. Meanwhile, the share of national income captured by the richest one percent rose from 8 percent in 1975 to 23.5 percent in 2005. Under Dwight D. Eisenhower, the president in the 1950s, the nation’s richest paid an effective tax rate of 70 percent after loopholes. Today, it’s 16 percent – significantly lower than the 25 percent forked over through payroll deductions by individual workers earning between $34,500 and $83,600 a year. That resulted from deliberate policy changes. Beginning with Ronald Reagan, country club conservatives cut taxes for the wealthy, while at the same time ending routine minimum wage increases and undermining the bargaining rights of labor. The changes were made by increasingly wealthy politicians increasingly influenced by lobbyists. For example, 60 percent of the freshmen in the U.S. Senate and 40 percent in the U.S. House are millionaires. By contrast, only 1 percent of Americans are worth more than $1 million. Compounding that is corporate influence, which worsened last year when the U.S. Supreme Court enabled corporations to donate unlimited money in secret. The upshot is corporations like General Electric, spending millions to lobby and paying zero in federal income taxes. GE spent $200 million to lobby for loopholes in the federal income tax code over the past decade, made $26 billion in American profits over the past five years, and not only paid absolutely no federal income taxes, but got itself a $4.1 billion rebate from the IRS. That is far from an anomaly. Two out of every three U.S. corporations paid no federal income taxes from 1998 through 2005, according to a report by the Government Accountability Office. And the situation hasn’t improved since then. U.S. Sen. Bernie Sanders has written repeatedly about tax avoidance by the likes of Bank of America and Goldman Sachs, Wall Street banks that former President George W. Bush handed hundreds of billions in bail out dollars. Bank of America got a $1.9 billion tax refund from the IRS last year, even though it made $4.4 billion. Goldman paid only 1.1 percent in federal income taxes on its $2.3 billion in profits. New York Times reporter David Kocieniewski wrote in his story about GE that such tax dodging by corporations has resulted in a significant decline in federal revenue from corporations – from 30 percent in the 1950s to 6.6 percent in 2009. Tax avoidance is a virtuous cycle for greedy corporations and the wealthy. They pay less in taxes, then have more money to lobby politicians to lower their taxes. In fact, it’s gotten so bad that lawmakers are hiring lobbyists right from their K Street firms to write legislation. And Congress’ new right wingers are increasing this trend. Since they took office in January, nearly half of the 150 former lobbyists working in top policy jobs in Congress were hired. For workers, however, it’s a vicious cycle. They’re forced to pay the taxes shirked by greedy corporations and the insatiable wealthy. And they’re forced to suffer service cut backs. Right now, right wingers are trying to cut $51.5 billion from the federal budget – demanding elimination of programs essential to the middle class and poor such as subsidies for home heating for the impoverished. But if the wealthy paid their share, say hedge fund manager John Paulson who earned $2.4 million an hour in 2010 – then those cuts would be unnecessary because the federal government would have an extra $69.5 billion in revenue. Forty-three years ago on April 4 Martin Luther King was assassinated after standing up for the right of public sector workers in Memphis, Tenn. to negotiate for better lives. Greedy corporations and the wealthy have made it to the mountain top. And they’re shoving American workers down the hillside to ensure the Promised Land is reserved only for the richest. The promise of America democracy is equality. Equal rights, equal treatment under the law, equal opportunity. Freeloading by greedy corporations and the insatiable wealthy is denying those promises to the vast majority of citizens. Americans must unify and march to wrest back those rights and secure the American Dream for all. 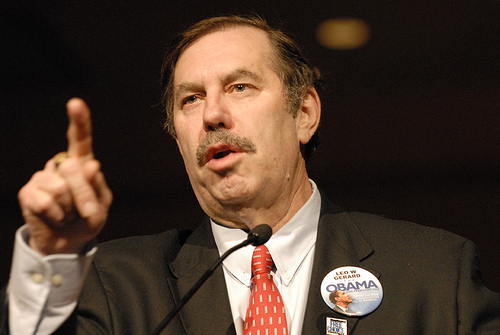 Leo W. Gerard is the international president of the United Steelworkers union. He is a member of the AFL-CIO Executive Committee and chairs the labor federation’s Public Policy Committee. Obama’s is breaking bread with CEO’s, and the CEO’s are Breaking Unions!